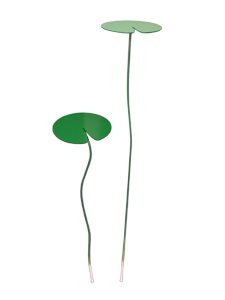 New Water-lily lamps are to be launched for the lightening company By Rydéns at the Stockholm Furniture Fair February 9-13. Welcome to spot them at Stand C 06:51. During the Stockholm Design Week VladimirMarket will have a show at Handlar'n, Vanadisvägen 42, as a part of Design in Vasastan. Open to public February 9-14. Opening Tuesday 9th, 6-8 pm. Scenography by Erika Lövqvist and Karin Robling. 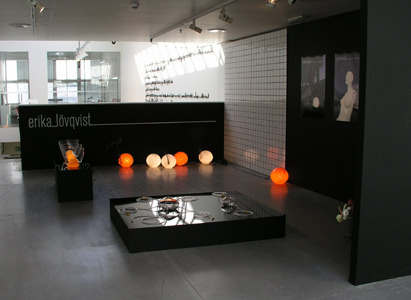 During the Palermo Design Week (25-31 of May 2009) Erika Lövqvist is representing Sweden in the exhibition Design's Stories. A conference is held at Saturday 30th. Erika Lövqvist is going to speak at a seminar at Kulturmagasinet in Sundsvall, May 14th 4pm. Welcome! 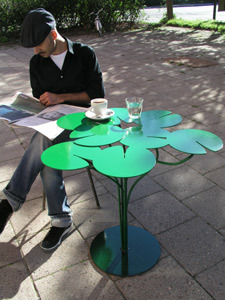 A new version of the Water-lily table, solid cast in the ground is now out. 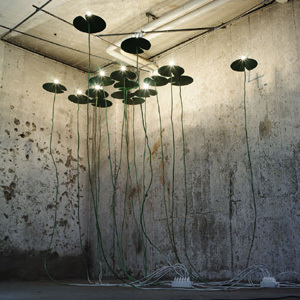 The Water-lily lamps was awarded with Young Swedish Design. "A highly poetic light formation which turns the room perspective upside down, creating interesting shadows and giving us the feeling of being at the bottom of a magical pond. 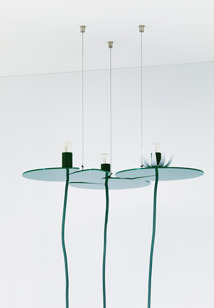 Delightful with a lamp that introduces a naturally exotic, winding element in the room. Water-lily accentuates and beautifies the electric cords which we otherwise try our best to hide - here they are allowed to take up space and divide the room in an unexpected but soft way." The exhibition is going to travel around in Sweden and internationally. 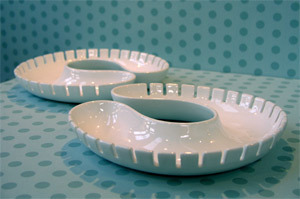 Erika Lövqvist will show new products at the Formex fair in Stockholm, August 28-31st. Welcome to visit stand B12:10b in the Young Designers Area. Erika Lövqvist is attending an exhibition curated by Li Edelkoort. 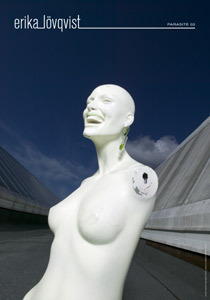 The exhibition is a part of Stavanger 2008, European Capital of Culture. Location: Varner Invest - Gravarvn. 32, Sandnes, Norway. July 4th- October 5th. The Water-Lily lamps, the Water-Lily carpets and the Parasite jewellery are now avalible at Design OnLine. 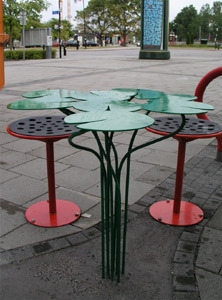 During the Stockholm Furniture Fair, February 7-10th 2008, Erika Lövqvist will attend an exhibition at Telefonplan, Stockholm. More info at www.telefonplan.com. Erika Lövqvist is going to teach a Product Design class at Gävle Art School 14-18th of January 2008. 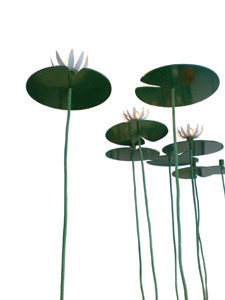 The Water-lily lamps are now avalible at Chimra, Renstiernas gata 22, Stockholm. The Ung 06/07 exhibition will be shown at Tent London during the Design week in London, September 20-23rd 2007. The Old Truman Brewery, 91-95 Brick Lane. More info at www.tentlondon.co.uk or at www.ung0607.se or further down on this page. Ung 06/07 is also going to be shown at 100% Design in Tokyo, Japan in October. Satellite in Milan, Italy April 18-23 2007. Welcome to visit stand B 32! The tiles ILLUSION recieved Wallpaper* Design Award 2007 for Best Wallcovering! "We're under no illusion when we declare that these are the most innovative tiles we saw in 2006." "STILL COMFUSED. BUT ON A HIGHER LEVEL"
Bottnia and Umeå Kulturförvaltning. January 21 3pm. 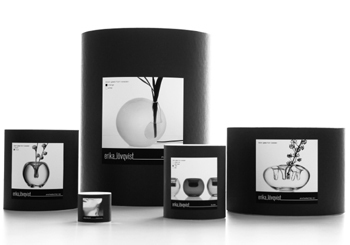 During the design biennale Erika Lövqvist will attend two exhibitions. 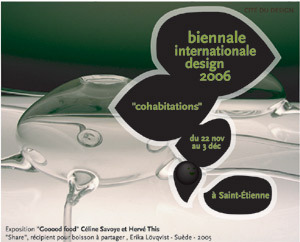 Co-Habitations curated by Matali Crasset and Gooood Food curated by Céline Savoy and Hérve This. Both exhibitions are located at La Manufacture - Fabrique 5000. Rue Rémi Anino. November 22 - December 3. Erika Lövqvist exhibits toghether with Save Our Souls at 100% East during the Design Week in London, 21-24th of September. Welcome to visit us at stand B18 at the Old Truman Brewery, 91-95 Brick Lane! A new collection, WATER-LILY, is coming up. Below a coffee table and shelves. Welcome to visit my stand A-13 at SaloneSatellite, the Furniture Fair in Milan, April 5-10th! 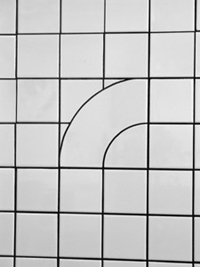 The tile series ILLUSION was awarded with Young Swedish Design 06/07. 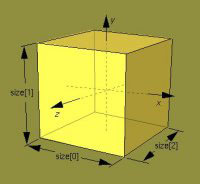 "It is often the apparently simplest ideas that are the strongest. The "Illusion" tile effectively creates a trompe l'oeil effect when it shifts perspective at selected locations. More than this is not required to create a disruption to our ingrained habits." The touring exhibition opens at the Greenhouse at Stockholm Furniture Fair February 8-12th. UNG 06/07 is also showed at Svensk Form, Stockholm, February 17th - March 19th and at Malmö Form/Design Center March 31st - May 15th. Brännbart. 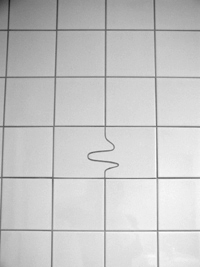 Svensk Form, Stockholm. November 10th - February 5th 2006. 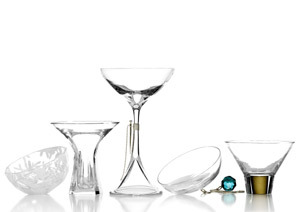 This is the five nominated martini glasses in the Swedish final. Charlotte Ryberg and Charlotte Hanno. Ceremony in Blå Hallen, The Stockholm City Hall, Novermber 14th. 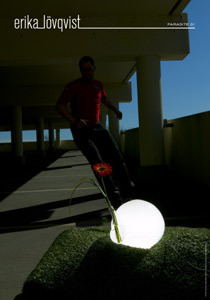 The PARASITE lamps are now avalible at Chimra, Stockholm. Roma Kungsgård. Gotland. June 10th - June 28th. Konstfack are exhibiting their final projects at school. Vårutställningen, Konstfack. Stockholm. May 17th -May 29th. An image from Vårutställningen at Konstfack.